Cut Opening software was created as a REVIT tool to aid in collaborating between different parts of the project regarding openings. This collaboration is driven by .xml files that contain information about opening position, opening size, opening joining distnce, services that openings contain, etc. Now we have added new communication parameters that allow users to share their ideas straight in the model. The new parameters for collaboration have been added to families. Users can write comments and approve or decline the openings. And of course it keeps track of who added the comments. To more easily find declined openings, all the families contain a “Comments Visible” option. Toggle it on/off to activate 3D text on the openings, as seen below. 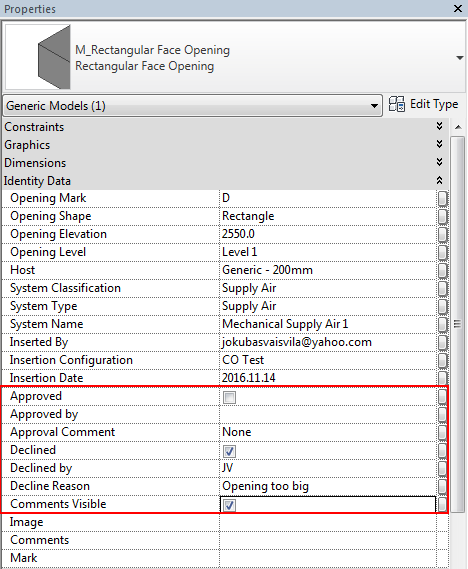 Now architects can comment on openings and approve or decline them by Cut Opening software. All the comments are saved in a .xml file, which the MEP engineer can use to make final changes to the model. We hope this feature will widen the possibilities for collaboration between MEP engineers, architects, and structural engineers. If you are already a Cut Opening user, you should see a special icon (red bubble) in the TOOLS4BIM Dock window that appears near the product and notifies that this application requires updating. If you want to try this BIM solution for Revit®, it is easy to do: just CLICK HERE to download a trial of this software.